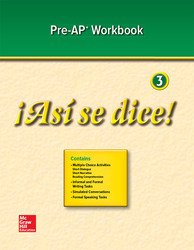 The Pre-AP Workbook, Student Edition addresses the types of activities students will face when taking the Spanish AP exam. Practice activities are set up in the format of the questions on the AP exam. Students who are not on an AP track will also benefit from these activities.